President Trump signed a declaration designating September 3 as a “Day of Prayer” for Hurricane Harvey victims. The president said that it was appropriate “during times of great need to ask for God’s blessing and God’s guidance.” Thus, even before federal funds start pouring into the region, Americans implored God’s aid. There are those who might dismiss the gesture as a purely political act to cater to the religious sensibilities of values voters. They do not understand the power of prayer and especially public prayer. The President’s declaration was important because it signaled an official recognition of an inconvenient truth that liberals find irritating: God can intervene in History by hearing our prayers. Our prayers can make a difference. It does no good to argue with those who deny this truth. We can only say with Saint Thomas Aquinas that for those who believe, no explanation is necessary. For those who do not believe, no explanation is possible. However, for those who do believe, we must pray now for those things America needs most in the face of Hurricane Harvey. While everyone is thinking of material assistance, Harvey should compel us to pray for those spiritual needs that often are neglected. 1. Hurricanes, like foxholes, tend to make quick believers out of atheists. We should pray for those who made resolutions to amend their lives and return to God during the storm. May God grant them the grace to change their lives and not forget their good resolutions. 2. For those who did not make such good resolutions, yet live lives of sin, we should pray that Harvey may prove to be an occasion to abandon sin and start their lives all over again in virtue. 3. Similarly, we should pray for those survivors who love God, that Harvey may prove to be an occasion for them to confide yet more and give thanks for God’s protection. 4. We should pray for those who grieve for the loss of family and friends, that God may comfort them in their sorrow. 5. We should pray for our priests and bishops that they assume a role of sanctifying leadership in helping people convert back to God after Harvey. Natural disasters often serve as times of reflection about how we have offended God. We should consider how our offenses separate us from God, and how our sins, public and private, are now obstacles that prevent His aid and blessings upon us at this time when they are most needed. 6. Thus, we should pray that the offenses to God committed in Houston’s massive abortion clinics come to an end soon. It makes no sense that we celebrate those who survived Harvey while the killing of the innocent continues unabated. 7. In the face of the blasphemies committed against God and the Blessed Mother in Houston (especially the present exhibit of P*** Christ), we should pray that these offenses stop since they will impede the city and the nation’s spiritual and material recovery. 8. Disasters often cause dramatic change in the lives of people. We should pray for all those Americans that heroically helped in the rescue operations. And may their good example during Harvey serve as a rallying call for heroism in all fields in these times of trial for America. 9. We should pray for the nation where the disordered passions of people resemble a powerful hurricane that devastates the country. We should pray that America returns to God and His moral law. 10. We should pray to Our Lady of Fatima on this hundredth anniversary of the apparitions. Mary foretold times of great trials if men did not convert. We should pray for the conversion of America and confide in her great mercy. These are ten things we can pray for after Harvey. They may not be politically correct, but they are much needed. Material reconstruction is essential to the recovery of the region. 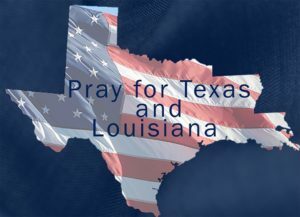 However, the moral recovery of Houston and America is much more urgent and should be the object of our ardent prayer. 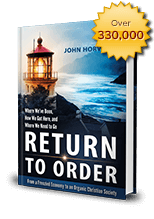 This entry was posted in Featured and tagged America, Day of Prayer, good resolutions, history, Houston, Hurricane Harvey, Order, President Trump, return to God, Texas by John Horvat II. Bookmark the permalink.